UPDATED: On May 19, 2011, Katie Couric stepped down as the anchor of the CBS Evening News. Couric's tenure was marked by low ratings — aside from an initial publicity-driven bounce when she took over in September 2006, the Evening News consistently lagged ABC's World News and the NBC Nightly News — and a showcasing of the liberal mindset Couric previously displayed as the longtime co-host of NBC's Today (for many examples, see our earlier reports here and here). — Katie Couric on the September 16, 2010 CBS Evening News. — Couric on the CBS Evening News, October 7, 2010. — Couric on the October 14, 2010 CBS Evening News. — Discussing the supposed divide between the Tea Party and the Republican Party during CBS State of the Union coverage, January 25, 2011. — Couric opening a CBS News special report on President Obama's post-election press conference, November 3, 2010. 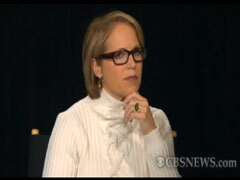 — Couric during panel discussion with freshmen members of Congress, CBS Evening News, January 5, 2011. — Couric talking to comedian Mo Rocca on her @katiecouric web show, December 22, 2010. "There is a debate to be had about the sensitivity of building this center so close to Ground Zero. But we can not let fear and rage tear down the towers of our core American values." — Couric on Ground Zero mosque for "Katie Couric's Notebook" on Couric & Co. blog, August 23, 2010. "Good evening, everyone. Barack Obama, the presumptive Democratic nominee for President, is about to begin a major overseas tour designed to bolster his foreign policy and national security resume, and help him be seen as a credible Commander-in-Chief and potential leader of the free world." — Katie Couric kicking off the July 18, 2008 CBS Evening News. "It has been an Obamathon ever since the presumptive Democratic presidential nominee touched down in Afghanistan. At today's press conference in Amman, a throng of reporters recorded his every move. In total, 200 journalists requested seats on 'Air Obama' — 40 of them were accepted. The bill for the trip? About $20,000 each." — Couric wrapping up the July 22, 2008 Evening News from Amman, Jordan, as part of her network's coverage of Obama's trip. "You campaigned to change the culture in Washington, to change the politics-as-usual culture here. Are you frustrated? Do you think it is much, much harder to do that than you ever anticipated?" — Couric to Obama in an interview shown on the February 3, 2009 Evening News. "You're so confident, Mr. President, and so focused. Is your confidence ever shaken? Do you ever wake up and say, 'Damn, this is hard. Damn, I'm not going to get the things done I want to get done, and it's just too politicized to really get accomplished the big things I want to accomplish'?" Couric: "Mr. Obama, by the way, has continued a presidential tradition, what Thomas Jefferson called 'neology,' making up a new word or giving new meaning to an old one....Talking about the fuss over health care reform, President Obama has introduced us to 'wee wee'd up.'" President Obama: "There's something about August going into September where everybody in Washington gets all wee wee'd up." — Evening News, August 24, 2009. "The 'Dream Team' pushing Chicago's bid for the 2016 Olympic summer games is nearly complete. First Lady Michelle Obama landed today in Denmark where Olympic officials are meeting....The team captain, meanwhile, President Obama, arrives Friday ahead of the final vote." Senior political correspondent Jeff Greenfield: "This was very much like he was in the campaign. He went five or ten minutes without a single applause line. He said 'let me tell you how we got into this mess,' he reached out and said to people 'I'm not giving up my idea that we can change the tone of politics.'..." Couric: "Well, as Tom Friedman said, 'He's better at making us smarter than making us angry.'" — From CBS's live coverage following the State of the Union, January 27, 2010. "In a poll conducted a month ago — just a month ago — 71 percent of the Jews in Israel surveyed said they dislike President Obama; 47 percent expressed a strong dislike....To change public opinion in your country, should you be more strongly advocating on his behalf?" 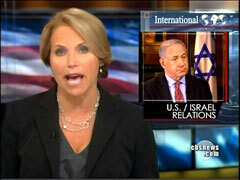 — Couric to Israeli Prime Minister Benjamin Netanyahu, July 7, 2010 Evening News. "A recent CBS News poll shows that 53 percent of the American people fully backs the stimulus package, 63 percent of people we polled thought the Republican opposition to the stimulus package was for political reasons. So, are you out of touch with the American people?...Do you think the Republicans are digging themselves in a hole by not being more supportive of the President's proposals?" 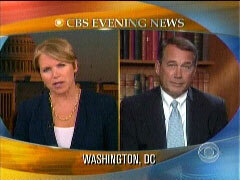 — Couric interviewing Republican House Leader John Boehner on the February 24, 2009 Evening News. Couric: "President Obama made an in-person appeal to House Republicans to vote for his economic stimulus plan, but it didn't work. Not a single Republican joined the majority Democrats tonight as the House passed the more than $800 billion package...."
White House correspondent Chip Reid: "Republicans relentlessly attacked the bill despite the President's extraordinary efforts to get bipartisan support...."
Couric: "Chip, as you mentioned, I mean, the President went up to the Hill to personally appeal to Republicans already, so what more can he do?" — Evening News, January 28, 2009. "Do you feel as if you owe President-elect Obama one [an apology]?...You said, on whether Senator Obama is a Marxist, you said, quote, 'It's a good question to ask.' Are you sorry you said that?...What really irritated — even enraged — some Democrats was your speech at the Republican National Convention. Did you understand at the time how nervy that might seem to some Democrats? How inappropriate?" 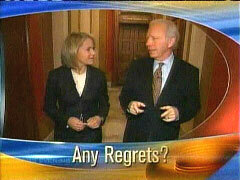 — Couric to Senator Joe Lieberman, who supported John McCain, November 19, 2008, Evening News. "Tonight, Arizona's controversial new immigration law. Police will now be able to make anyone they choose prove they're here illegally. It triggers demonstrations by both sides and a warning from President Obama." "Hundreds of thousands of them [illegal immigrants] now live in Arizona. But as Kelly Cobiella reports, many no longer feel welcome." — Evening News, May 3, 2010. "The uproar continues over Arizona's new immigration law. The commissioner of Major League Baseball today brushed off calls from Latino groups to move next year's All-Star game out of Phoenix. But Bill Whitaker reports, the boycott of Arizona is spreading." — Evening News, May 13, 2010. "More than 46 million Americans have no health insurance. So when it comes to life, liberty and the pursuit of happiness and good health, all men are not created equal." — Couric, Evening News, March 12, 2007. "The timing could not be worse. Just as he [President Obama] was pushing so hard for health care reform and having some pretty serious setbacks....How do you think the President can, if he can, resuscitate this whole effort?" — Couric to Bob Schieffer, referring to the flap over Obama's crack that police acted "stupidly" in arresting Henry Gates, July 24, 2009, Evening News. "Once again, we begin tonight with the battle over health care reform, but this time, we're not starting at a town meeting. Tonight, we're going to show you why many believe reform is desperately needed. These are just some of the tens of thousands of Americans who need health care but have no insurance or not enough of it, and they're lining up at a free makeshift clinic in Los Angeles." 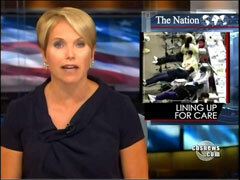 — Couric opening the August 13, 2009 Evening News. Katie Couric: "[Secretary of State Condoleezza Rice] rejects the notion that the U.S. is a bully, imposing its values on the world." Condoleezza Rice: "What's wrong with assistance so that people can have their full and complete right to the very liberties and freedoms that we enjoy?" Couric: "To quote my daughter, 'Who made us the boss of them?'" Couric: "I think it's one of the most embarrassing chapters in American journalism. And I think there was a sense of pressure from corporations who own where we work and from the government itself to really squash any kinds of dissent or any kind of questioning of it. I think it was extremely subtle but very, very effective. And I think Scott McClellan has a really good point." "Do you feel any sense of guilt that the Iraq war, which you helped sell to the American people, has resulted in the loss of life for thousands of American soldiers?" — Couric to former Bush press secretary Scott McClellan in an Evening News interview, May 29, 2008. Couric: "More now on the history that was made by the Democrats last night. For the first time, a woman will become Speaker of the House....A lot has been made of the fact that you, if elected, and it appears that you will be, that you will be the first woman Speaker of the House and the highest ranking woman in the United States government. What does that mean to you?" House Speaker Nancy Pelosi: "It's pretty exciting, I have to say. I'm just so excited that a Democrat will be Speaker of the House." Couric: "So you're a Democrat first, a woman second?" — Interview with a Pelosi after Democrats won control of Congress in 2006 midterm elections, Evening News, November 8, 2006. "One of the great lessons of that campaign is the continued and accepted role of sexism in American life, particularly in the media. Many women have made the point that if Senator Obama had to confront the racist equivalent of an 'Iron My Shirt' poster at campaign rallies, or a Hillary nutcracker sold at airports, or mainstream pundits saying they instinctively cross their legs at the mention of her name, the outrage would not be a footnote. It would be front-page news." Bashing Palin: What Happened to Feminist Solidarity? "I spoke with your running mate, Sarah Palin, and she told me that if action is not taken, a Great Depression is quote 'the road that America may find itself on. '...Isn't so much of this, Senator McCain, about consumer confidence and using rhetoric like the 'Great Depression' — is that the kind of language Americans need to hear right now?" "Everyone was waiting to see how the political newcomer would do tonight and perhaps the headline is Governor Sarah Palin did not embarrass herself or her running mate as some Republicans might have feared and some Democrats might have hoped." — Couric during live coverage following the vice presidential debate on October 2, 2008. "Experts have been warning for years that this country's infrastructure is crumbling. But are taxpayers ready to spend the billions, maybe trillions, it would take to fix all the pipelines, tunnels and bridges?" — Couric reporting on the Minneapolis bridge collapse, Evening News, August 2, 2007. "In Britain, a government takeover of a bank last year helped to temporarily calm fears in the financial markets there. Nationalization may have a psychological impact as well, and Uncle Sam wrapping his arms around failing banks in this country might provide a big dose of confidence for the American consumer." — Couric writing about the Oscars on her CBSNews.com blog, Couric & Co., February 26, 2007. "Also in Washington today, a lot of excitement on Capitol Hill. A movie star showed up to testify before Congress – a movie star named Al Gore." "He was once called 'Mr. Stiff.' Now he's known as 'The Goreacle,' the new Al Gore....Sharyn Alfonsi reports on Gore 2.0." — Evening News, May 25, 2007. "I'm honored to be joined today by the Godfather of Green, the King of Conservation: Former Vice President Al Gore." "In January a new Congress swept into Washington promising ethics reform, fiscal responsibility, and a change in direction for the war in Iraq. Now they're on August recess so how did they do? We called Thomas Mann, co-author of a book on Congress called The Broken Branch. The mood he said, continues to be ugly on Capitol Hill but this new crop worked much harder than the last. A big accomplishment was in challenging executive power with oversight hearings on Iraq, Medicare, the Department of Justice, and global warming. Stem cell legislation and immigration reform were stymied, but Congress did raise the minimum wage and pass an ethics and lobbying reform bill....Promises, promises. Sometimes they are kept even in Washington." — "Katie Couric's Notebook," Couric & Co. blog, August 6, 2007. Couric: "One of the key players in getting this deal approved is the Speaker of the House, Nancy Pelosi. I talked to her this afternoon as Senate negotiators were announcing the agreement and we spoke right after she had been on the phone with the President. [to Pelosi] Are you surprised how intimately involved he is in the whole process?" House Speaker Nancy Pelosi: "Quite frankly, yes. I said, 'Mr. President, neither of us has time for this conversation, especially you,' because we really, we understand each other. We know where we need to go." Couric, smiling: "Can you tell us anything he said to you, like, 'Get cracking'?" Pelosi, laughing: "No, never that. We're always cracking." "Tonight, the President calls it 'astounding.' The recession has now cost nearly four-and-a-half million Americans their jobs. We'll show you the new jobs his stimulus plan is creating...."
— Couric introducing series of reports on the March 6, 2009 Evening News. "As Politico reported, there's growing concern among some GOP leaders that controversial commentators and far-right conservatives have hijacked the message. People like Rush Limbaugh and Sarah Palin appeal to the base, and you certainly need that base to win elections. But in an age when 42% of Americans call themselves 'independents,' you can't win with just the base, either....[A]s the number of declared Republicans hits a 26-year low, according to a poll in the Washington Post,...Republicans need to get the focus back onto the Big Tent where all are welcome and off the sideshows that are popping up along the party's fringe." — Couric in her "Katie Couric's Notebook" video posted on CBSNews.com, October 27, 2009. "He [Pope Benedict XVI] is very conservative. And I know a recent poll says 62 percent of Catholics believe the church isn't reflective of their views. Does that mean entertaining issues like women as priests or use of birth control will be really off the table as long as he's Pope?" — Couric to Father Thomas Williams on the April 15, 2008 Evening News. "Agree with him or not, he [John Edwards] deserves credit for pushing tough issues off the back burner. He encouraged his fellow Democrats to speak out for the disenfranchised and under-served. He was the first to raise issues like poverty, universal health care and climate change, proposing big ideas — sometimes controversial ideas — to meet big challenges. He bucked the conventional wisdom and took political risks, speaking honestly about why he wanted to raise taxes, for example. That took courage." — Couric in a January 30, 2008 "Katie Couric's Notebook" video posted to CBSNews.com a few hours after Edwards quit the presidential race.